Healthcare real estate investment activity kicked off 2019 on a high note, courtesy of Welltower’s (NYSE: WELL) highly anticipated $1.3 billion, 3.3 million-square-foot MOB portfolio acquisition of the CNL Healthcare Portfolio. Medical office sales remained very strong throughout 2018, slightly eclipsing $11.3 billion in total sales volume for the year. 2018’s volume ranks as the second highest yearly medical office sales total on record following 2017’s record $12.5 billion in total sales but still well above 2016’s $10.2 billion in total sales. Price-per-square-foot values also remained competitive in 2018, experiencing a slight uptick in quarter-over-quarter averages, and a substantial jump in year-over-year values – $337-per-square-foot in Q4 2018 vs. $297-per-square-foot at the end of 2017, according to data published by Real Capital Analytics. 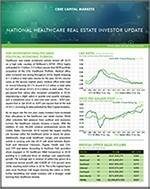 As we segue into the new year, many investors have increased their allocations to the healthcare real estate market. While other industries feel pressure from political and economic turmoil, the healthcare industry remains a haven. With the addition of over 50,000 medical professionals across the United States, December 2018 marked the largest monthly job increase within the healthcare sector in nearly 30 years. Additionally, large-scale healthcare merger and acquisition activity is carrying over into 2019 with deals between Baylor Scott and Memorial Hermann, Dignity Health and CHI, and CVS and Aetna. According to Kaufman Hall, providers alone engaged in 90 healthcare M&A transactions in 2018 pointing to a continued focus on strategic over opportunistic growth. The average size in revenue of sellers has grown at a compound annual growth rate (CAGR) of 13.8 percent since 2008, reaching $409 million in 2018. This is the highest figure seen since Kaufman Hall began tracking this metric in 2008, further benefitting real estate investors with a stronger credit backing their healthcare tenants.